This statement rings true in more ways than one. When I look back on my life. 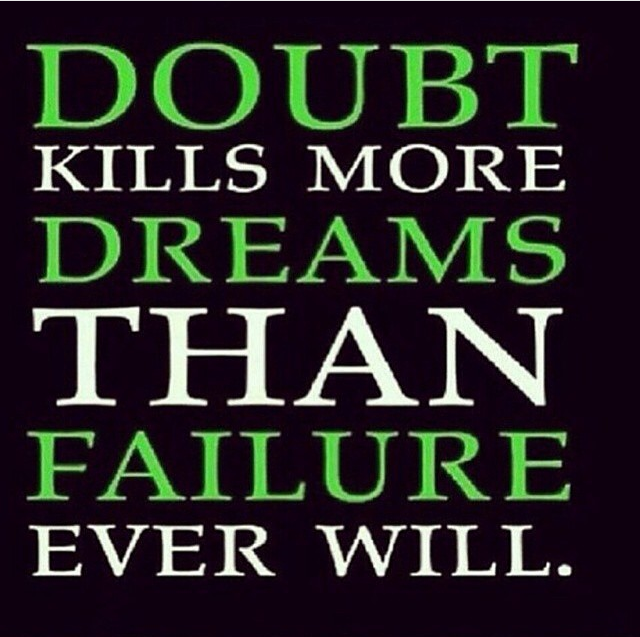 I can remember doubting my abilities and as a result dismissing dreams and ideas. I would talk myself out of just about everything and anything that I might have wanted to do. As if it wasn’t bad enough. Allowing my doubts to dictate and kill my dreams, my fear of failure would finish off any remaining thoughts I would have of possibly accomplishing anything. Doubt and Fears go hand in hand and when my addiction was added to the mix. It accomplished the mission of making me believe that I could not do it. I am learning that my thoughts do not have to dictate my actions. My addiction (my thoughts) doesn’t want me to succeed at anything. I have allowed myself to believe that I didn’t measure up for years and it became second nature to kill my own dreams before they ever got off the ground. I became a failure simply because of lack of effort. Deep down inside. I could hear a little voice screaming at me. What are you doing? You can do this man. But the voice was weak and somewhat defeated. It was being drowned out by all the noise inside my head. It was stifled by the screams of the full grown baby that was my addiction. That was the story of my life for years. On the flipside there were times when I would attempt things. Whether it was taking a test, apply for a job or learning something new and I would ace it. I would do exceedingly well. So I started to feel a little confused. I was torn between the good and the bad and things just got even more ugly. I felt like I had duel personalities for years. I always seemed to favor the bad. My addiction was out of control and I had lost all hope of ever becoming anything. I was a lost soul or so I believed. That little voice kept me going. When I was alone and crying, feeling pitiful and desperate that little voice kept telling me to hold on. That things were going to change. That little glimmer of hope was my divine intervention. That glimpse of better days ahead eventually led me to recovery, to where I am today and will continue to lead me to where ever it is that I want to go tomorrow. I am in a good space today. I am facing and conquering my fears. I am taking healthy risks and accomplishing my dreams. The same dreams that I believed I could not accomplish, and new dreams that I am allowing to surface and explore. I am growing, changing and expanding my horizons. I truly believe that skies the limit. That there is nothing that I cannot do. I don’t doubt that for a minute. It’s incredible this journey of recovery. I would never have imagined I would be living like this. It just didn’t seem possible. This entry was posted in 2015 and tagged addiction, doubt, failure, FEAR, hope, recovery, success. Bookmark the permalink.